Adam Sandler In OK Looking Movie Shocker! | Warped Factor - Words in the Key of Geek. Adam Sandler In OK Looking Movie Shocker! It's been a long time since an Adam Sandler movie has looked like it was worth a trip to the multiplex - possibly why he's now making movies for Netflix - but he may be about to break what has been a near decade long run of dreadful, dreadful 'comedies' with this Summer's Pixels. In Pixels, aliens intercept video feeds of classic arcade games and misinterpret them as a declaration of war, so they attack the Earth. But not in a War of the Worlds tripod way, instead they use the video games as the models for their assaults. So who is going to fight the enormous PAC-MAN, Donkey Kong, Galaga, Centipede, and hordes of Space Invaders? That would be Sam Brenner (Adam Sandler), Will Cooper (Kevin James - because Sandler owns him), Ludlow Lamonsoff (Josh Gad), and Eddie “The Fire Blaster” Plant (Peter Dinklage). They've already saved the world thousands of times – but that was back in the 80s at 25cents a game in the video arcades. Now, they’re going to have to do it for real. 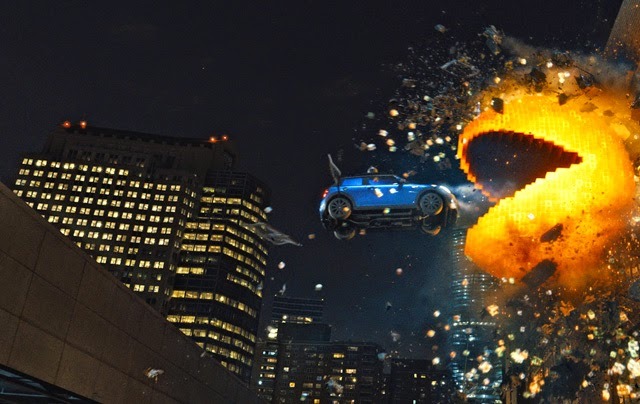 Pixels is released in the US on July 24th, and the UK on August 12th.